this scale could be consistent with legislation and national policies protecting National Parks, AONBs or World Heritage Sites, the Commons Business, Energy and Industrial Strategy Committee backed the Government's approach on a nuclear dump and decided against calling for national parks and areas of outstanding natural beauty to be excluded. Also the UK government states that it will seek to place plutonium in any underground GDF...meanwhile ..Sweden says No to burying nuke waste. as the UK increases its bribes to areas prepared to host the waste forever. In 2013 Cumbria County Council votes to say 'No Thanks' to Highly Radioactive waste caverns... so then central government changes rules and says Copeland and Allerdale Councils can have final say...and both want to Take the Money! Then central government over rules any local views...See 2015 report. Both Copeland and Allerdale Councils have endorsed the moves to have highly radioactive spent nuclear fuel buried in caverns. The plans are also linked to the plan to build a new generation of nuclear power stations, possibly including one in Cumbria, to be called Moorside. In January 2013 Cumbria County Council voted not to offer its area as a volunteer site for an underground dump. The county council argued that the waste was better stored and monitored in surface facilities, as is the case at present. But then central government overturned this council rejection and changed the rules so Copeland and Allerdale can both 'volunteer' to have the dump and associated community bribes. Now the government has also enabled any local concerns to be over ruled as the project is now classed as strategic infrastructure, as with the other unviable taxpayer funded project HS2. A report to the government's Nuclear Decommissioning Authority (NDA) in 2008 confidently claimed: "A wide range of generic repository Concepts is available that can provide safe and secure geological disposal options to suit any appropriate UK geological environment." 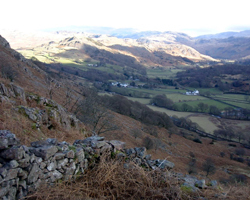 The one organisation charged to protect our Lake District, the Lake District National Park Authority (LDNPA), has signed up to become a partner in what has been branded and marketed as 'The Vision' for both new nuclear reactors and an underground dump. But to quote from LDNPA's latest strategy document: "It is not appropriate to either support or object to the location of such a site in West Cumbria at this early stage. More information is needed to make an informed decision. The best way to get this is to be involved in the selection procedure." To quote from the LDNPA minerals and waste strategy: "The likelihood of West Cumbria being put forward as a potential volunteer community is very high. We cannot underestimate the importance of us being involved in the decision making process. " This came as the Park bids for World Heritage status in 2011. Meanwhile typical of the way our money is used to sweeten the pro-nuclear message...the West Cumbrian tourism body West Cumbria Tourism was part funded by Nuclear Management Partners who run Sellafield. Almost all derived from UK taxpayers....West Cumbria's Energy Coast Board has £20 million from Nuclear Management Partners.The NMP, NDA and Sellafield Ltd have pooled their £10 million per year socio-economic resources into Britain's Energy Coast. The previous bid for a nuclear underground dump by Nirex in the 1980s was only for intermediate level nuclear waste and even that was ruled out by the then Tory government after a lengthy public inquiry. Sellafield does look after the current massive collection of 'legacy' nuclear waste, some remaining radioactive for over 27,000 years. Lakestay says that allowing the government to claim spent nuclear fuel from new reactors can be dumped underground in Cumbria forever not only gives a false 'green light' for new reactors, but it may also not be the best option for Britain. Lakestay says radioactive waste should be supervised above ground (thus ensuring future jobs and expertise continues) rather than the planned bury and walk away plan. Supervising waste above ground will allow future technological breakthroughs which may enable dangerous isotopes to be changed and make the waste safe. Jobs at Sellafield will be secure for decades as the Cumbrian site has to look after the UK waste forever. Imagine the scale of the waste excavations to take both legacy waste and all spent nuclear fuel from a new commercial scale reactors. a choice is being made now while the LDNPA says "It is not appropriate to either support or object to the location of such a site in West Cumbria." Well done to the National Trust for describing the goverment's National Policy (NPS) as "unfit for purpose". The Trust states: "With regard to waste disposal, we are concerned that this issue has not been dealt with sufficiently within the NPS and that the IPC is not required to consider the issue of waste disposal in its consideration of applications. As no long-term storage disposal solution for nuclear waste has yet been identified, this means that all nuclear waste from new generating facilities will have to be stored on-site for a significant time-period. This has the potential to increase the risk of each site to the environment, local populations and visitors and the level and nature of this risk should be calculated and communicated to all local stakeholders during the consultation process." And what of the Cumbria Tourist Board? Will they also try and stay neutral? We asked (July 2009) for their views on a future underground nuclear dump and/or new nuclear power stations. Below is the response from their Public Relations department. 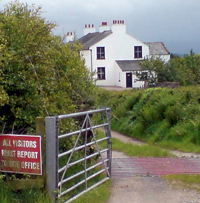 "The tourism and nuclear industries in Cumbria have co-existed for many years and a number of tourism businesses, such as Muncaster Castle and the Ravenglass & Eskdale Railway, are successfully operating within close proximity of Cumbria's current nuclear site at Sellafield. "Over the last three years, visitors to the Copeland area have grown at a faster rate than any other part of the county - attracting an additional 7% of visitors, which in turn resulted in an increase in the number of tourism jobs in the area. "Any investment planned for Cumbria's West Coast should be welcomed, especially in the current economic climate. Investment has the potential to deliver a prosperous local economy, which will in turn make the area more attractive to both visitors and locals as we will see improvements to the public realm (the overall appearance of the place) and development in new facilities; from accommodation to cultural attractions and facilities. "Cumbria Tourism does not have the technical authority to comment on any specific points raised that relate to the day-to-day operation of the Sellafield site, but any issues that may effect visitors or tourism businesses are immediately brought to our attention by our major partner, the County Council who are represented on Cumbria Tourism's Executive Board. "As is the case with any major development, we will closely monitor the impact of potential nuclear new builds on both visitor enjoyment and our tourism businesses and, along with the public, will have an opportunity to put our (and our membership's) views forward as part of the Government's consultation process." REACTION of Cumbrian Artist, Julian Heaton Cooper. 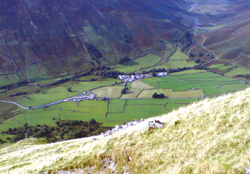 "I agree there is a great risk of the English Lake District being 'volunteered' for a future underground nuclear dump and organisations such as the National Park Authority need to take a far more robust attitude than appears to have been the case so far. It is no use custodians of the Lake District staying neutral over the possibility of highly radioactive waste, that is active for 27,000 years, being buried beneath the Western Lakeland. Lakestay are quite right to highlight these concerns." It is not just high and intermediate level nuclear waste the industry needs to try and dispose of. By re branding some types of low level nuclear waste as VERY LOW level waste, the industry hopes to get it buried in the domestic and trade landfill dump at Lillyhall. Thus ironically the more householders take the time to recycle their domestic waste the more space they free up for burial of radioactive contaminated waste. This is because in the past Lillyhall has already received similar types of material. Its all quite legitimate, said Mike Travis, because under existing legislation there are 3,000 tones of what we call NORM waste there  naturally occurring radioactive material. NDA's total discounted lifetime cost estimate for the establishment of the geological disposal facility for higher activity wastes is £4.3 billion, of which NDA's share as shown in its Annual Report and Accounts is £3.7 billion with the remainder being funded by other waste producers. This investment will be incurred over a period of many decades and includes costs for research, design, construction, operation and final closure. And to see the immense task if anything goes wrong with a nuclear reactor.